Enjoy hassle-free service with Baker Brothers Plumbing, Air Conditioning & Electrical. Local Dallas & Fort Worth experts with your best interests in mind. Call now at 214-892-2225214-892-2225 to get started with an initial diagnosis. There is nothing like personalized service when your plumbing or air conditioning system is stressing you out. Call Baker Brothers Plumbing, Air Conditioning & Electrical at 214-892-2225214-892-2225 to enjoy true peace of mind in no time! Are you looking for a service professional you can trust to call for all of your plumbing and air conditioning needs? You are in the right place! Baker Brothers Plumbing, Air Conditioning & Electrical caters to Dallas and the surrounding areas. We are local professionals focused on delivering the right solutions at the best value. We are here to solve your toughest challenges and return your property to normal – all without any hassle on your part. If you are ready to start discussing your needs, give us a call. We make every effort to provide same-day or next-day service. We have maintained a loyalty among employees and customer for over 70 years. This has been accomplished through consistently delivering upon our promises, doing what's right, and being honest. 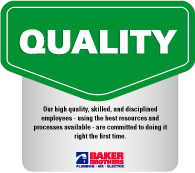 Our high quality, skilled, and disciplined employees - using the best resources and processes available - are committed to doing it right the first time. 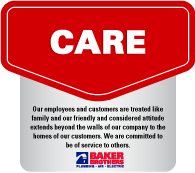 Our employees and customers are treated like family and our friendly and considered attitude extends beyond the walls of our company to the homes of our customers. We are committed to be of service to others. 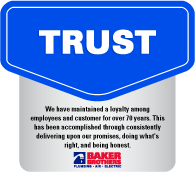 Baker Brothers Plumbing, Air Conditioning & Electrical began with a simple idea – to help our community by providing outstanding quality and tireless customer service. Over half a century later, our values remain the same. While we have kept up with the latest technology and industry standards, we continue to uphold our commitment to top-notch customer service. In 1945, Robert Tiner – who at 17 became the youngest Master Plumber in the state of Texas – went into business with two brothers named Baker and opened a Roto Rooter franchise. The plan was simple: Roto Rooter would try to unstop the lines, and Baker Brothers Plumbing would repair or replace the plumbing if they couldn’t. Under Robert Tiner’s management, Baker Brothers Plumbing thrived. Before long they had a fleet of trucks. Howard Baker eventually sold his Dallas Roto Rooter franchise to his nephew Paul Harris. In the mid-1980s, Paul sold the franchise again. At this point, the relationship between Baker Brothers and Roto Rooter dissolved. With the recession and the addition of big box retailers, business was slim. In the late 1960s, Robert Tiner’s daughter Kay married Jim Dale, who came to work for Baker Brothers. Jim quickly became an excellent plumber. In 1986, Robert Tiner passed the Baker Brothers torch to Kay and Jim. After just two years at the helm, the couple took a huge risk and purchased a prototype sewer video inspection system that would revolutionize the plumbing industry. It consisted of a video camera that could go into sewer lines and find leaks in residential homes. Baker Brothers became the first plumbing company in Texas to feature this type of technology. 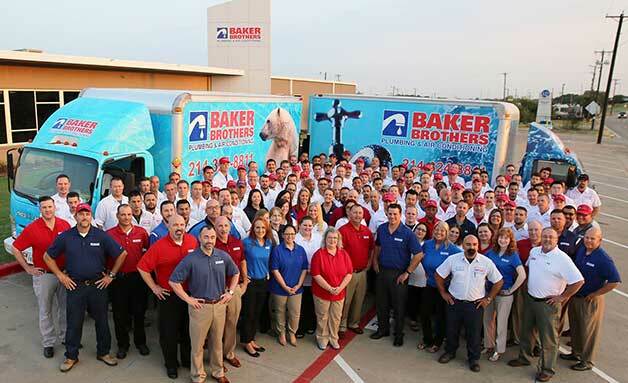 This one purchase, along with Jim’s demand for quality and fairness, was the driving force that propelled Baker Brothers through the next decade. Soon, Baker Brothers was being called on by engineering firms and insurance adjusters to help investigate foundation failures and locate slab leaks. The company’s early adoption of new innovations over the next several years led Baker Brothers to become one of the foremost experts in the field of forensic mechanical investigations. In 1993, Jim Dale hired his son Jimmie, Jr. and positioned Baker Brothers for a complete rebirth. Over the next seven years our fleet of trucks grew from just three to twenty-two. In the process, we became known as one of the premier leak location experts in Dallas. Mold claims ransacked the insurance industry in 2002. Several insurance companies began writing policies that excluded water damage and foundation repairs. In an effort to help harried homeowners, Baker Brothers Plumbing & Air Conditioning went back into the residential service industry. Over the next three years we became one of the top service providers in the area. In 2013, we extended our specialty to heating and cooling services. In 2018, we added electrical services. We remain dedicated to quality and customer service, which make up the basis for everything we do and the reason we can proudly say we are the plumbers you can trust. Baker Brothers is now owned and operated by The Wrench Group effective February 1, 2017.